The Algonquins are indigenous inhabitants of North America who speak the Algonquin language, a divergent dialect of the Ojibwe language, which is part of the Algonquian language family. 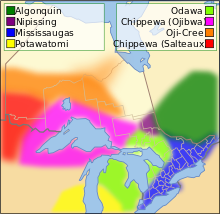 Culturally and linguistically, they are closely related to the Odawa and Ojibwe, with whom they form the larger Anicinàpe (Anishinaabe) grouping. The Algonquin people call themselves Omàmiwinini (plural: Omàmiwininiwak) or the more generalised name of Anicinàpe. Though known by several names in the past, the most common term "Algonquin" has been suggested to derive from the Maliseet word elakómkwik (IPA: [ɛlæˈɡomoɡwik]): "they are our relatives/allies". The much larger heterogeneous group of Algonquian-speaking peoples, who, according to Brian Conwell, stretch from Virginia to the Rocky Mountains and north to Hudson Bay, was named after the tribe. Many Algonquins still speak the Algonquin language, called generally Anicinàpemowin or specifically Omàmiwininìmowin. The language is considered one of several divergent dialects of the Anishinaabe languages. Among younger speakers, the Algonquin language has experienced strong word borrowings from the Cree language. Traditionally, the Algonquins lived in either birch bark or wooden mìkiwàms. Today Algonquins live in housings like those of the general public. In the earliest oral history, the Algonquins say they migrated from the Atlantic coast. Together with other Anicinàpek, they arrived at the "First Stopping Place" near Montreal. While the other Anicinàpe peoples continued their journey up the St. Lawrence River, the Algonquins settled along the Kitcisìpi (Ottawa River), a long-important highway for commerce, cultural exchange and transportation. Algonquin identity, though, was not fully realized until after the dividing of the Anicinàpek at the "Third Stopping Place". Scholars have used the oral histories, archeology, and linguistics to estimate this took place about 2000 years ago, near present-day Detroit. After contact with the Europeans, especially the French and Dutch, the Algonquin nations became active in the fur trade. This led them to fight against the powerful Iroquois, whose confederacy was based in present-day New York. In 1570, the Algonquins formed an alliance with the Montagnais to the east, whose territory extended to the ocean. Algonquin couple, 18th-century watercolor. The first Algonquian encountered by the French were the Kitcisìpiriniwak ("Ottawa River Men"; singular: Kitcisìpirini), whose village was located on an island in the Ottawa River; the French called this group La Nation de l'Isle. The Algonquin first met Europeans when Samuel de Champlain came upon a party led by the Kitcisìpirini Chief Tessouat at Tadoussac, in eastern present-day Quebec, in the summer of 1603. They were celebrating a recent victory over the Iroquois, with the allied Montagnais and Etechemins (Malecite). Champlain did not understand that the Algonquins were socially united by a strong totem/clan system rather than the European-styled political concept of nationhood. The several Algonquin bands each had its own chief. Within each band, the chief depended on political approval from each of the band's clan leaders. Champlain needed to cultivate relationships with numerous chiefs and clan leaders. From 1603, some of the Algonquin allied with the French under Champlain. This alliance proved useful to the Algonquin, who previously had little to no access to European firearms. Champlain made his first exploration of the Ottawa River during May 1613 and reached the fortified Kitcisìpirini village at Morrison Island. Unlike the other Algonquin communities, the Kitcisìpiriniwak did not change location with the seasons. They had chosen a strategic point astride the trade route between the Great Lakes and the St. Lawrence River. They prospered through the collection of beaver pelts from native traders passing through their territory. They also were proud of their corn fields. At first, the French used the term "Algonquin" only for a second group, the Wàwàckeciriniwak. However, by 1615, they applied the name to all of the Algonquin bands living along the Ottawa River. Because of keen interest by tribes to gain control of the lower Ottawa River, the Kitcisìpiriniwak and the Wàwàckeciriniwak came under fierce opposition. These two large groups allied together, under the leadership of Sachem Charles Parcharini, to maintain the Omàmiwinini identity and territory. The Iroquois Confederacy drove the Algonquins from their lands. They were aided by having been traded arms by the Dutch, and later by the English. The Iroquois and the English defeated the French and Algonquins. In 1623, after Sir David Kirke's occupation of New France demonstrated French colonial vulnerability, the French began to trade muskets to the Algonquins and their allies. French Jesuits began to seek Algonquin conversions to Roman Catholicism. Through all of these years, the Iroquois never attacked the Kitcisìpirinik fortress. But, in 1642, they made a surprise winter raid, attacking the Algonquin while most of the warriors were absent, and causing severe casualties. 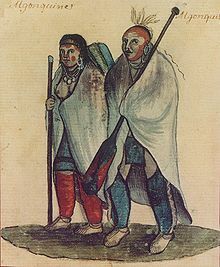 On March 6, 1647 (Ash Wednesday), a large Mohawk war party attacked the Kitcisìpiriniwak living near Trois-Rivières and almost exterminated them. The Kitcisìpiriniwak were still at Morrison Island in 1650 and inspired respect with their 400 warriors. When the French retreated from the Huron country that year, Tessouat is reported to have had the superior of the Jesuit mission suspended by his armpits because he refused to offer him the customary presents for being allowed to travel through Algonquin territory. Some joined the mission at Sillery, where they were mostly destroyed by an infectious disease epidemic by 1676. Encouraged by the French, others remained at Trois-Rivières. Their settlement at nearby Pointe-du-Lac continued until about 1830. That year the last 14 families, numbering about 50, moved to Kanesatake near Oka. (The families who stayed in Trois Rivieres can be found in the Algonquin census of Trois Rivieres in the mid-19th century). The Sulpician Mission of the Mountain was founded at Montreal in 1677, and some Algonquins settled there together with Iroquois converts. The mostly Mohawk community became known as Kahnawake. But many Algonquin maintained their attachment to the traditional territory and fur trading. Those who agreed to move to established reserves or joined other historical bands were federally "recognized". Many others who did not re-locate were later called "stragglers" in the Ottawa and Pontiac counties. Starting in 1721, many Christian Algonquins began to settle for the summer at Kahnesatake, near Oka. The Mohawk Nation was then considered one of the Seven Nations of Canada. Algonquin warriors continued to fight in alliance with France until the British conquest of Quebec in 1760 during the Seven Years' War. After the British took over colonial rule of Canada, their officials sought to make allies of the First Nations. Fighting on behalf of the British Crown, the Algonquins took part in the Barry St Leger campaign during the American Revolutionary War. Loyalist settlers began encroaching on Algonquin lands shortly after the Revolution. Later in the 19th century, the lumber industry began to move up the Ottawa valley, and a lot of Algonquins were relegated to a string of small reserves. The historical Algonquin society was largely hunting and fishing-based. Being primarily a hunting nation, the people emphasized mobility. They used materials that were light and easy to transport. Canoes were made of birch bark, sewed with spruce roots and rendered waterproof by the application of heated spruce resin and bear grease. During winter, toboggans were used to transport material, and people used snowshoes to get around. The women used tikinaagan (cradleboards) to carry their babies. It was built with wood and covered with an envelope made of leather or material. The baby was standing up with his feet resting on a small board. The mother would then put the tikinàgan on her back. This allowed the infant to look around and observe his surroundings. The child was kept close to the mother but also had much stimulation. Algonquian-speaking people also practiced agriculture, particularly south of the Great Lakes, where the climate allows for a longer growing season. Notable indigenous crops historically farmed by Algonquins are the sunflower and tobacco. Around 800CE, Eastern Algonquians adopted maize agriculture from their neighbors in the interior. Even among groups who mainly hunted, agricultural products were an important source of food. They obtained what was needed by trading with or raiding societies that practiced more agriculture. Eastern Algonquians created pots that could withstand not only thermal stress but the mechanical stress of rough use. Archaeological sites on Morrison Island near Pembroke, within the territory of the later Kitcisìpiriniwak, reveal a 1,000-year-old culture that manufactured copper tools and weapons. Copper ore was extracted north of Lake Superior and distributed down to present-day northern New York. Local pottery artifacts from this period show widespread similarities that indicate the continuing use of the river for cultural exchange throughout the Canadian Shield and beyond. Some centuries later, the Algonquin tribe moved in and inhabited the islands and shores along the Ottawa. By the 17th century the first Europeans found them well established as a hunter-gatherer society in control of the river. The Kitcisìpiriniwak showed entrepreneurial spirit. On Morrison Island, at the location where 5,000-year-old copper artifacts were discovered, the Kitcisìpirini band levied a toll on canoe flotillas descending the river. They use an infusion of leaves of Epigaea repens for kidney disorders. They use the berries of Ribes glandulosum as food. They gather the fruit of Vaccinium myrtilloides to eat and sell. They use the berries of Viburnum nudum var. cassinoides for food. In 1981, members of the Algonquin tribe successfully blockaded a commercial rice-harvesting venture which the Government of Canada had granted permission to harvest wild rice. The tribe had traditionally gathered this grain by hand for centuries. Hundreds of people blockaded roads, and despite police helicopters, paddy wagons, and "a lot of hostility and pushing and shoving," according to Harold Perry, honorary chief of the Ardoch Algonquins, the tribe and its supporters held their ground for 27 days—long enough for the federal government to reverse its decision and revoke the commercial permit. In recent years, tensions with the lumber industry have flared up again among Algonquin communities, in response to the practice of clear-cutting. In Ontario, an Algonquin land claim has been ongoing since 1983, encompassing much of the southeastern part of the province, stretching from near North Bay to near Hawkesbury and including Ottawa, Pembroke, and most of Algonquin Provincial Park. The Algonquins never relinquished title to this area. An agreement-in-principle between the Algonquins of Ontario, the Government of Canada and the Government of Ontario was reached in 2015. Members of the Algonquin tribe began a peaceful blockade of an operation on their sacred lands north of Kingston, Ontario, on June 29, 2007. Oakville-based Frontenac Ventures Corporation, the prospecting company, sought a court order to force the protesters from the area. A court injunction was obtained on August 27, 2007, and a series of arrests followed, including that of the Ardoch Algonquin First Nation co-Chiefs Robert Lovelace and Paula Sherman. Chief Lovelace served a six-month sentence for contempt of court for violating the injunction, which required all protesters to remain at least 200 metres (660 ft) from the mining site. Chief Sherman also received a six-month sentence, but it was suspended as she agreed to respect the injunction. Tens of thousands of dollars in fines were levied against them. In addition to the charges of contempt, Frontenac Ventures is suing the Algonquins for $77 million in civil damages. On March 18, 2008, contempt charges were dropped "without costs" against three non-native activists: Frank Morrison and Christian Peacemakers David Milne and Reverend John Hudson. They had been charged with violating the same injunction as Lovelace and Sherman, but Frontenac Ventures declined to prosecute. During the same proceedings, however, warrants were obtained for the arrest of five other non-native activists who allegedly violated the injuncton. At the time of their first meeting with the French in 1603, the various Algonquin bands probably had a combined population somewhere in the neighborhood of 6,000. The British estimate in 1768 was 1,500. As of 2000, there are close to 8,000 Algonquins in Canada, organized into ten separate First Nations: nine in Quebec and one in Ontario. Kichesipirini ("people of the great river") — They were the largest and most powerful group of Algonquins. Known variously as: Kitcisìpirini, Kitcisìpiriniwak, Algoumequins de l'Isle-aux-Allumettes, Big River People, Gens d l'Isle, Honkeronon (Wyandot language), Island Algonquian, Island Indians, Island Nation, People from the Island, Kichesippiriniwek, Nation de l'Isle, Nation of the Isle, and Savages de l'Isle. Their main village was on Morrison Island. Kinounchepirini ("people of the Pickerel-waters") — Also known as Keinouche, Kinouchebiiriniwek, Kinònjepìriniwak, Kinonche, Pickerel, Pike and Quenongebin. Sometimes they were listed as an Algonquian band, but after 1650 they were associated with the Ottawa and were originally found along the lower Ottawa River below Allumette Island. "Otaguottaouemin" — Also known as Kotakoutouemi or Outaoukotwemiwek. They were located along the Upper Ottawa River above Allumette Island. Sàgaiganininiwak ("people of the lake") — Also known as Saghiganirini. "Saginitaouigama" — Also known as Sagachiganiriniwek. Weskarini ("people of the deer[-clan]") — Also known as the Wàwàckeciriniwak, La Petite Nation, Little Nation, Ouaouechkairini, Ouassouarini, Ouescharini, Ouionontateronon (Wyandot language), or Petite Nation. Their traditional home land is located on the north side of the Ottawa River along the Lievre River and the Rouge River in Quebec. "Iroquet" — They were known as Hiroquet, Hirocay, Iroquay, Yroquetto, and to the Huron as the Atonontrataronon or Ononchataronon; they lived along Ontario's South Nation River. Matàwackariniwak "people of the bulrushed-shore" — Also known as Madawaska, Madwaska, Matouchkarine, Matouashita, Mataouchkarini, Matouechkariniwek and Matouescarini; the Madawaska River in the Upper Ottawa Valley is named after this band. "Nibachis" — Located at Muskrat Lake near present-day Cobden, Ontario. These population figures are from Canada's Department of Indian and Northern Affairs. The Nipissing First Nation of North Bay, Ontario, is also sometimes considered to belong to the Algonquin group of Anishinaabeg. ^ "Assembly of First Nations - The Story". The Assembly of First Nations. Archived from the original on 2009-08-02. ^ Artuso, Christian. 1998. noogom gaa-izhi-anishinaabemonaaniwag: Generational Difference in Algonquin. Winnipeg: The University of Manitoba Press. ^ Cuoq, Jean André. 1886. Lexique de la Langue Algonquine, Montréal: J. Chapleau & Fils. ^ a b Snow, Dean R. (2010). Archaeology of Native North America. New York: Prentice Hall. p. 223. ^ "Ardoch Algonquin First Nation". Aafna.ca. Archived from the original on 2012-08-13. Retrieved 2012-05-18. ^ Ministry of Aboriginal Affairs of Ottawa. Claim Map. Accessed 2010-11-25. ^ "Algonquins of Ontario Proposed Agreement-in-Principle". Government of Ontario. Retrieved May 4, 2016. ^ "Ardoch Algonquin First Nation". Aafna.ca. 2007-08-23. Archived from the original on 2012-02-11. Retrieved 2012-05-18. Daniel Clément, The Algonquins. Hull, Quebec: Canadian Museum of Civilization, 1996. Yvon H. Couture, Les Algonquins. Val d'Or, Quebec: Éditions Hyperborée, 1983. Robert Michael Morrissey, Empire by Collaboration: Indians, Colonists, and Governments in Colonial Illinois Country. Philadelphia, PA: University of Pennsylvania Press, 2015. Evan T. Pritchard, No Word for Time: The Way of the Algonquin People. Tulsa, OK: Council Oak Books, 1997. Richard White, The Middle Ground: Indians, Empires, and Republics in the Great Lakes Region, 1650-1815. Cambridge, England: Cambridge University Press, 1991. Wikimedia Commons has media related to Algonquin people.